Add ageless beauty to your home or business with hardwood flooring. In Colorado Springs, CO, we offer a wide variety of hardwood floors so your options are virtually endless. For a sophisticated-looking living area, why not consider installing hardwood. The quality products we carry last a lifetime and increase the value of your property. Give your rooms a makeover by depending on our flooring company for an endless variety of hardwood floors and excellent hardwood flooring prices. Choose the stain, size, finish, and wood species to suit your needs. The ideal hardwood floor is waiting for you at Absolute Flooring America. 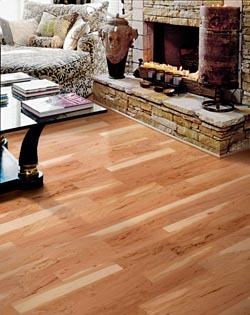 We also offer our products at ideal hardwood flooring prices. We understand that deciding on the right floor is a challenge. Whether you have an idea in mind, or you need some inspiration, you can depend on our skilled design team to help you choose a floor the perfectly suits your needs. Solid hardwood can be installed just about anywhere except moisture-prone areas. If you want hardwood flooring that is resistant to moisture, choose engineered hardwood flooring. Manufactured using multiple layers of strong, moisture-resistant materials, these floors offer superior strength. They withstand the heaviest foot traffic as well. These floors are also available in all types of wood species. Why limit yourself when you’re shopping for hardwood floors? Some stores offer products, but not services. At our store, we not only have a huge supply of name-brand hardwood floors, but we also perform professional hardwood floor installation. Make your shopping experience enjoyable and hassle-free from start to finish. Allow our team to help you choose your floor and then install it on your schedule. Take advantage of our special guarantees on all of our products and services. If you find a lower price on the same product within the 30 days of your purchase, we’ll refund you the difference. In addition, we’ll also repair any installation-related problem that you ever have – that’s our lifetime installation guarantee! For a free consultation, stop by our store today and speak with our friendly sales associates. Contact us to find out more about our 12-18 month financing plan. We proudly serve Colorado Springs, Monument, Black Forest, Manitou Springs, Colorado, and surrounding areas.